People in Grenoble are not from Grenoble. That is to say, three quarters of them. They come from France, of course, but also from many other countries and a total of 40 communities have been listed. Grenoble is a melting pot, a city of activists that has managed to look beyond the differences and achieve true cultural diversity. The book « The people up there » dealt with how city dwellers see mountain people. But what if, just once, we let the mountains express themselves ? What would they have to say about us, the people down there, who strangely enough often look down on them. A corrosive look at an immemorial relation that was never simple. Damien. Do you remember ? At the end of the 1960s, two very young friends decided to sail around the world on their boat, Damien, with stops for the icy summits of the Arctic and the Antarctic. Sailors and mountaineers are truly cut of the same cloth. A remarkable adventure that started… in the mountains around Grenoble, told here by the author. Across the Atlantic, Grenoble is compared to Bariloche or Queenstown. But for a Canadian gal who is familiar with every large mountain city in the world, the capital of the Dauphiné region is the place to be not only for its summits, but for its cuisine and endless discussions on Alpine topics… with a nice bottle of Gamay on hand. True love. He clearly had a warm spot for the working women in the Brun factories. And a more neutral approach to the technological wonders produced by the major research labs. Robert Doisneau shifted between militant reporter, industrial photographer, observer of the social upheaval of his time, humorous ad man, artist and… playful father. All unknown facets of a very engaging personality. A friendly dialogue between two urban mountaineers. One is MP and mayor of Grenoble, the other a born and bred Parisian and one of the major alpinists of the last century. They share a commitment to the summits and, above all, a political project to expand access to the mountains. To all social classes. In the street. That is where these striking juxtapositions were made, between the old walls of Lakanal and the stunning architecture of the new Bonne quarter. The square portraits by Corentin Mossière and the brightly coloured iPhone images by Bruno Moyen. In the street. That is also where photography occasionally goes to exhibit in Grenoble. The philosopher from Geneva will be honoured in 2012 for the 300th anniversary of his birth. An occasion to look back at his stays in the Savoy and the Isère department. Notably in Grenoble, that he mentioned in one of his Reveries. The diary of his host confirms, in an amused chronicle of a stay that did not go unnoticed in the capital of the Dauphiné. The working class in Grenoble came into being with the development of hydroelectric power and is still alive and kicking. But it has undergone profound change. A social (r)evolution that, if we took the time, could teach us a great deal about the world today. 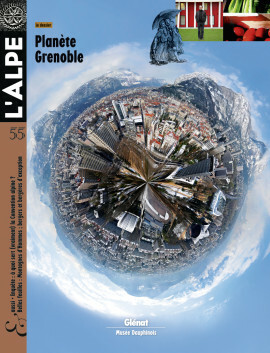 The image projected by Grenoble has changed greatly over the last few decades, right up to a certain « Grenoble speech » in July 2010, in which nothing, neither the content nor the style, matched the city that the Grenoblois know. The vitality and attractiveness of this vast laboratory combining science and the Alps are still very real, but the famous triad university – research – industry must reinvent itself. An analysis. Just this once, we asked our friends and acquaintances to reveal their best (and most fun) addresses around town. Two women have produced a beautiful book on the people who bring mountains to life. Shepherds and shepherdesses are presented in a very poetic text that delves into the meaning of life when one has chosen such an unusual job. With photos of little nothings and mischievous portraits, snapped tenderly by a young photographer who knows how to talk to people. Excerpts. What is the point of the Alpine Convention ? The international treaty is now 20 years old, a good time to look at its usefulness, its successes and how it operates. Celebrated by some, criticised by others, the intent of the document was to federate the Alpine countries in order to protect and develop the range. Is the convention worth the effort ? A report.